B36 took all 3 points and 1st spot on the table when they beat B68 Toftir by 2 goals to 1. But B36 didn’t get the winner before 10 minutes from time, when Símun Hansen, who had come on for an injured Óbi, scored. B36 had taken the lead in the first half with a Sylla goal, but B68 leveled the score early in the second half with a penalty, after the referee had judged that Súni Fríði Barbá had been pushed in the penalty area. B68 were only 10 men on the pitch then, as their Dutch player was shown the red card early in the second half. However, B36 were also only 10 men, as Fróði Benjaminsen was sent off shortly before half time. Fróði will therefore be suspended for the match against neighbors HB on Wednesday and that will be a major blow for B36, but however, they won’t be too worried as they have just got Ingi Højsted back from Birmingham. Ingi came on today, when B36 re-organized their team after Fróði Benjaminsen’s red card. Against HB, Ingi Højsted will undoubtedly be in the starting line up. B36 is now 1 point ahead of EB/Streymur, but EB/Streymur might take the 1st spot back tomorrow, when they play away to NSÍ Runavík. B68 will feel unlucky that they didn’t get a draw today, although B36 had the majority of the ball, but they have proved that they are well organized defensively and will give many of the other teams a hard time. Next, B68 take on KÍ Klaksvík, but that will be without their Dutchman, who will be suspended after his red card today, and he will be sorely missed. ÍF Fuglafjørður are still without points as they lost gain, this time 3-1. ÍF equalized in the second half, but it was all in vain, as scored another two. But ÍF has been quite unlucky with injuries so far and today 4-5 starting regulars were missing. But even with those back, ÍF will find is likely going to struggle all the way and already they are 5 points behind B68 on 8th place and who seem to be far stronger than ÍF. Next Sunday, ÍF play VB/Sumba, where they’ll decide whom of them will be the challenger for the all important 8th place. The loser will surely be relegated, even if there will still be 21 games left to play and 63 points left to win. It’s still difficult to judge GÍ and how much they mean business, but over the coming weeks, they’ll get stiffer opposition when they play NSÍ (h), Skála (a), B36 (a) and KÍ (a) and then we’ll have a much clearer picture of Gí’s strength. For NSÍ it was crucial to win the game against highflying EB/Streymur today as a loss would have found them trailing EB/Streymur by 11 points. Such a margin would not be possible to win back and that’s maybe what spearheaded NSÌ today as they took the lead within 2 minutes with a penalty. And although NSÍ’s Óli Hansen was sent off midway into the first half, it was NSÌ who doubled their lead 7 minutes before halftime with a direct (!) corner. EB/Streymur dominated the second half, but could not get past Jens Martin Knudsen, but twice EB/Streymur hit the crossbar. It will be interesting to se if EB/Streymur will bounce back, but they do play some difficult games ahead: Skála (h), B36 (a) and KÍ (h). Likewise it will be interesting to see if NSÌ can build on today’s result, but also they have stiff opposition awaiting them: First GÍ (a), then ÍF home, which should produce 3 points, but then Skála (h) and B36 (a). The first half between Skála and HB was an even affair where both teams failed to create a great deal of clear-cut scoring opportunities. But on 18 minutes, HB nearly made it 1-0 after a corner, but the ball was saved on the line. Skála then countered and when they do that, they are lethal. 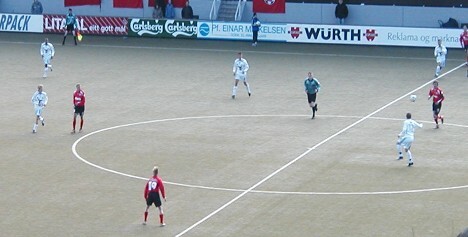 Jónhard Frederiksberg went flying down the right hand flank and sent a perfect high cross in front of goal where Teitur R. Joensen came running and headed the ball into the net. After that, HB tried to find openings in the Skála defence, but they could only produce half chances. In the second half it was HB all the way. - Well, at least they had the majority of ball possession, but again, they created few clear-cut opportunities. Mostly, their efforts were from corners and other set pieces and long distance shots, of which Rókur av Fløtum Jespersen had the best effort, but the Skála keeper made a diving save. About 15 minutes from time, Skála were reduced to 10 men, when Levi Hansen was shown the red card for a second bookable offence. HB kept pressing on and on 87 minutes their primacy finally paid off after a corner from the left and at the far post, Rasmus Nolsøe volleyed the ball into the net. All in all, a fair result, although HB had the most of the possession in the second half. On Wednesday, HB meet B36 in the Tórshavn Derby. B36 will be without influential midfielder, Fróði Benjaminsen, who is suspended. HB’s defensive midfield player, Kári Nielsen went out injured in the first half with a nasty wound on his cheek and seemed to be a bit groggy and could also miss the game on Wednesday. HB cannot afford to lose that game, as that will open up a gap of 9 points to B36. On the other hand, if HB win, they will have closed the gap to only 3 points. The match is brought forward to Wednesday, because B36 play against Icelandic Champions 2005, FH, on Saturday in the annual Atlantic Cup. The match will be played in Tórshavn. VB/Sumba lost again today, of course, one is tempted to say. KÍ only needed the first half to put 3 goals behind VB/Sumba. After 5 games, VB/Sumba’s scoring record is 3 goals for and 15 against. And 0 points, of course. That speaks for itself. Next Sunday VB/Sumba play ÍF, and even ÍF, who neither has earned a point yet this season, seems to be strong favourite for that match, as it look more and more difficult to see from whom VB/Sumba possibly can take points from. In 2 weeks they play home to B68, and if they’re still on 0 points after that match, then it’s surely already game over for VB/Sumba after only 7 matches. But how will the coming weeks turn out for KÍ? Will they keep marching on and take a medal in the end of the season? The next weeks will maybe give us some clues about that, when KÍ play B68 (a), HB (h), EB/Streymur (a) an GÍ (h).